I'll admit, when I learned there would be a new Dewey book, I was afraid it wouldn't measure up to the first one about the library cat from Spencer, Iowa. But, Vicki Myron and her co-author, Bret Witter, have managed to put together a book that made me start crying on page 9, and I cried off and on throughout the book. 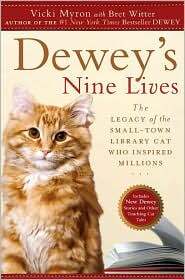 Tomorrow is release date for Dewey's Nine Lives: The Legacy of the Small-Town Library Cat Who Inspired Millions. I have the feeling this book, with the two new Dewey stories, and seven other stories of cats and their people will climb the bestseller lists as well. So, here's a sneak peek at the book, the trailer for this new book of cats and the people who love them. When librarian Vicki Myron told the story of her relationship with Dewey Readmore Books, the cat who inspired a town, she never expected that Dewey's story would top the New York Times Bestseller List. And, she never expected to receive over 3,000 letters, some about Dewey, but many relating how a cat had changed someone's life. In the new book, she tells some of those stories about the special bond between a cat and a person, and how loving a cat changed lives. She tells of a Vietnam vet whose cat literally fell from the sky into his life. There's a story of a strong single mother in Alaska. There's a story of a church cat, named Church Cat. My favorite story was the one about Cookie, a New York cat. For me, cats and cat books are summed up in one paragraph in this book. "We don't love cats out of need. We don't love them as symbols or projections. We love them individually, in the complex manner of all human love, because cats are living creatures. They have personalities and quirks, good traits and flaws. Sometimes they fit us, and they make us laugh in our darkest moments. And then we love them. It's really as simple as that." Dewey's Nine Lives is a touching book in which a number of people share the special cats in their lives. If you'd like to share your own special story, you can enter a contest the publisher is holding, "I Believe in Dewey's Magic." You can tell your own story, and it might be selected for the paperback edition of the book. Enter here. www.us.penguingroup.com/static/pages/features/dewey/index.html Or, you can share your cat's picture with other cat lovers at Dewey's Magic Facebook page, www.facebook.com/pages/Deweys-Magic/111732485524854?ref=search. Last week, when I launched the contests for dog lovers, I promised a future contest for cat lovers. Watch for Thursday night's contest, when I'll launch a giveaway of two copies of Dewey's Nine Lives. It's a book for all of us who have been lucky enough to share our lives with a special cat, or two, or five. Dewey's Nine Lives: The Legacy of the Small-Town Library Cat Who Inspired Millions by Vicki Myron with Bret Witter. Penguin Group (USA), ©2010. ISBN 9780525951865 (hardcover), 320p. Lynda Caira (Cookie Cat): Dewey's story inspired me because it is so unfathomable to conceive that a cat could change the lives of so many people. It makes me think, if we tried, how could people change each others’ lives? Kristie Graham (Marshmallow): Dewey's story inspired me throughout his entire life. I have known Vicki since I was 2 years old. … Dewey's Magic is real. It has opened the door to my heart to make sure people know what they have done for me. Barbara Lajiness (Sir Bob Kittens): I have always loved animals-- especially cats. So many things about Dewey spoke to me and my own experiences in life. Dewey was rescued, we rescued animals. Vicki only had one child, a daughter; I only had one child, a daughter; and many of those moments during teen years between a daughter and a mother were very similar to my own feelings as a mom of a teenager. Also the effects of poverty and alcoholism on my childhood were all themes I could easily relate to in Dewey. Although I didn’t know it at the time…I would also face my own battle with breast cancer. So as you can see my connection and inspiration to the book really happened on many levels, not just how deeply I can appreciate and relate to that significant bond and relationship with a cat. Kim Knox (Church Cat): I know cats are known for having "nine lives" but I was really impressed by the toughness of that little kitten in the book drop off box. It's like he knew if he could just hang on, something so much better was coming his way! Vicki Kleuver (Christmas Cat): Dewey's story inspired me because it is a story of Life. Not only Dewey's amazing life, but also Vicki Myron's life. Life can really throw us into the toilet or into a book drop on a frigid winter night, yet there is a spark, or a will to live that ignites within us to survive and thrive through the adversity of life. There were many similarities to the story of my “CC,” or Christmas Cat. … I was also amazed at the similarities between Vicki Myron's life story and my own. Lynda Caira (Cookie Cat): What I hope that people see in my Cookie's story is that she was in a way, a life safer to me! I have had cats before and after Cookie, but Cookie just ingratiated herself into my life in a way that most people haven't even been able to do! Carol Ann Riggs (Church Cat): Church Cat was "Special" to a lot of the members of the Camden United Methodist Church. She was a rescue cat and that made us happy too! Kim Knox (Church Cat): You don't always know why God puts someone or "somepet" into your life and we shouldn't take something like that for granted. Vicki Kleuver (Christmas Cat): I hope readers will gain from my story about CC a sense of understanding that love comes from many different sources in our lives, often when we least expect it and even at times from a source that we would never have considered, and we should approach each situation with an open mind. When CC came into my life, I didn't want a cat. I didn't even like cats! Or so I thought. CC was intended as a gift for my young daughter. Yet he turned out to be mine. Or as my mother says, I became "his people." I also hope readers will find in themselves a desire to do something new or different, to live life to its fullest. Norman Vaughn said "dream big, dare to fail." Lynda Caira (Cookie Cat): I think it depends on the cat and the person, and if they came into each others’ lives at the right time. I've had cats I've taken care of, and cats (strays) who I have felt that I HAD to take care of. My Cookie was the only cat who took care of me! Kim Knox (Church Cat): I have had a number of cats in my life and I don't think any two were ever alike! There is just something in their personality that clicks with your personality and next thing you know you're in love. Vicki Kleuver (Christmas Cat): As I said to Vicki Myron several times, I believe God brings these little critters into our life so we can rescue them, while they help to rescue us too. Whether it's a cat or a dog or another animal, there can be a strong bond. Cats have very unique personalities. I particularly enjoy cats that are independent, like me. Kristie Graham (Marshmallow): The most unexpected thing I learned from Marshmallow is that he would leave such a legacy. I really didn't acknowledge the impact he made on my life and the power he would have on my future. When I told [my acquaintances] that I participated in [Dewey’s Nine Lives], it surprised me how many people knew how close we were and how "different" our relationship was. Vicki Kleuver (Christmas Cat): The most surprising thing I learned from CC is that I like cats! CC was loyal, loving, affectionate, playful. He was adventurous--it was that sense of adventure that landed him in the toilet that Christmas eve night, and it was his sense of adventure that cost him his life. Some people, some animals, become afraid when they have experienced trauma. Not my CC. Not me either. I like that. While it broke my heart that CC died at such a young age, I respect that he died while doing something he loved; it takes a bit of the sting out of our loss. Regardless if we're a cat or a humanoid, isn't life what we make of it? Vicki Kleuver (Christmas Cat): Sadly, right now I don't have any cats. Two years ago we adopted an older dog from the Kodiak Animal Shelter and right now, due to frequent travel, he is our only pet. It is our hope to adopt from the animal shelter this winter either a cat or another dog. Kim Knox (Church Cat): After we lost Church Cat's son ChiChi we were catless for a couple of years. We now have two orange tabbies named Marmalade (2 yrs) and Macaroon (3 months). Both are house cats and help make our house a home. FTC Full Disclosure - The publicist sent me a review copy and two copies to give away, with no promises of a positive review. Sounds like another winner! And another touching read. Thanks for the Q and A below, too--it gives a nice glimpse into what the book will be covering. It is another winner, Elizabeth, despite my original misgivings. No, it probably won't be on the bestseller lists as long as Dewey, but it's another book with heart. I'm always afraid these kinds of books will be saccharine, but this sounds like a good one, with honestly moving and sweet tales (tails?). Thanks, Lesa. Definitely not saccharine; I just tend to cry over true animal stories. But, these aren't all sweet. The humans, and sometimes the cats, had rough lives at times. I think you'll like it. I didn't know there would be a catquel but I sure am going to add this to my list of books I absolutely need. Thanks for the review and the questions and answers from the participants of this book. Oh, I like that, Pam - catquel. That's a good word for this book, filled with all those cats. I know you're going to enjoy the book! Great review, Lesa. I enjoyed this book, too, although I didn't think it quite lived up to the original. Maybe it's because I generally don't enjoy anthologies as much as I enjoy books about just one single character, or, in this case, cat. The book is a wonderful testament to the role cats play in our lives, and makes you hug your own cats a little harder after reading, that's for sure. Thank you, Ingrid. You're right. I looked at my cats differently after reading it. And, I've appreciated each one as they climbed into my lap. I always love them, but it did make me, as you said, hug them a little harder. October is Adopt-A-Dog Month - Book Giveaway!